Did you accidentally delete some important videos from your iPad? Did you lose any video after upgrading your iPhone to iOS 11.3? Or did you wake up from a long night out with your friends only to find that some important office videos have gotten deleted from your iPad during your night of fun and frolic and you need them back urgently when you go to the office? Well, if you need to retrieve deleted videos from iPad urgently, don't fret! 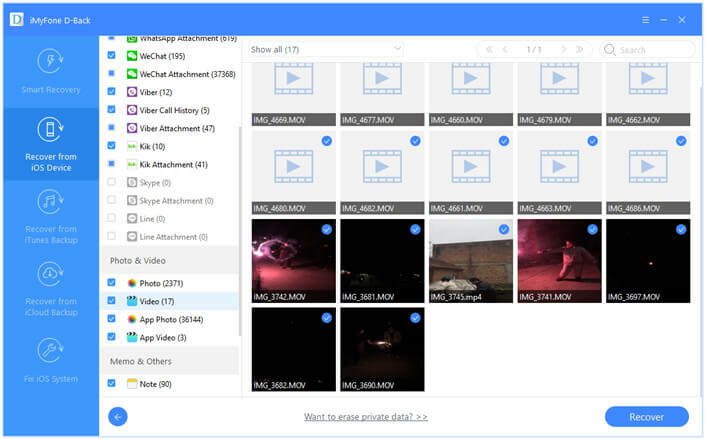 You can now get your important videos back using a variety of methods at your disposal without much hassle. There are several ways you can easily recover deleted videos from iPad. All the 4 methods are effective, so the method you choose depends on your personal preferences. Accident deletion, theft of gadgets and formatting are some of the common reasons how the users of iPad lose their data. Whether you are a victim or not you might have asked yourself several times that whether it is possible to get back deleted videos from iPad. Yes, you can easily retrieve the deleted videos in your iPad. All you need to know is the right method to make it possible and here we have the list of some unique solutions. In case that the videos get permanently, it is important to stop adding or deleting the rest of the data to iPad, or the deleted data will be completely overwritten by the new files. Everyone knows that you can back up your iPad videos on iTunes or iCloud. Therefore, you can recover the videos by restoring your iPhone (we will also introduce this method in the sections below). However, this method is not that ideal because you will lose all current data on your iPad. And some people may never back up their device before deletion. In this case, iOS data recovery tool work better for you. You can use the third party software such as iMyFone D-Back to retrievie deleted videos from iPad. iMyFone D-Back makes it easy to retrieve deleted videos from iPad whether you have a backup or not. This program is highly recommended by 9to5mac, Techradar, Pcworld, Engadget, Makeuseof, etc. 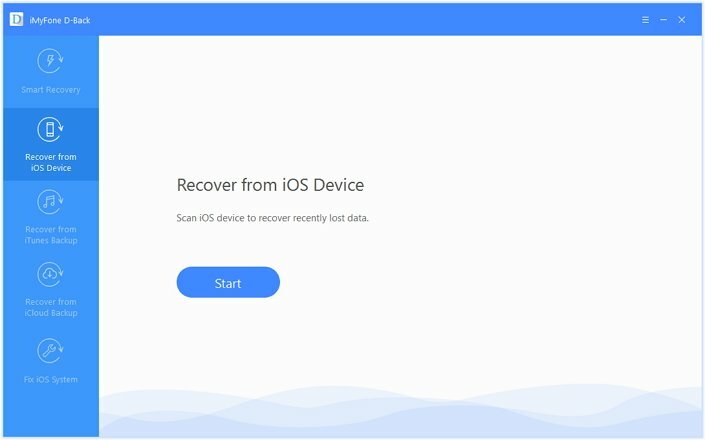 Four recovery modes increase the probability to recover your deleted data from iOS device, iTunes backup or iCloud backup. Preview your files for free before you recover them so you have complete control all the files you recover. Supports 22 file types of iOS content including photos, contacts, text messages, notes, voice memos, WhatsApp messages, Kik messages, Viber messages, etc. Supports almost all iOS versions on iOS devices, including iOS 11/11.1/11/2/11.3/11.4/12 and iPhone X/8, iPad Mini, iPad Air, etc. 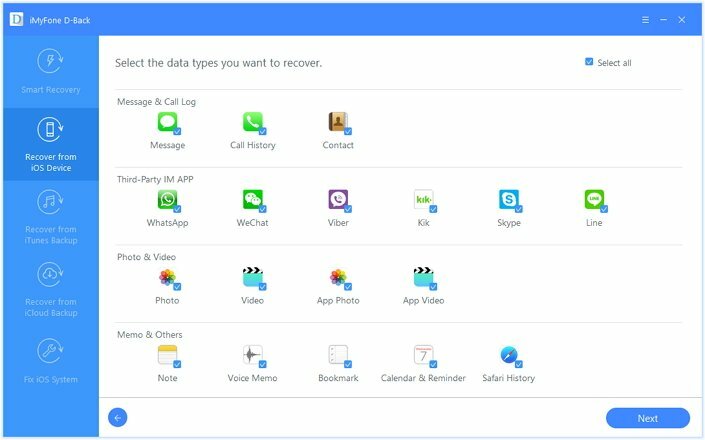 So many advantages make iMyFone D-Back program most comprehensive data recovery software for retrieving deleted videos from iPad. In case you are not sure, you can use Smart Recovery to retrieve deleted videos from iPad. Just select how you lost your videos. And let the software to choose the best mode for subsequent scan. Here we suppose that the program chooses the mode "Recover from iOS Device". Just select the file types you want to recover (e.g. click on video) and then click "Next". Then you will be asked to connect your iPad to the computer. Once the iPad gets detected by your computer, you can click "Scan" to continue. Once scan is completed, you will be able to preview the video files to find the videos you want to restore. You can also sort the video files by clicking on "Show only the deleted files" button to save your time. Simply click on "Recover" to pick the folder you want to recover the files in and all your selected videos will be extracted to that location shortly. As you can see, the iMyFone D-Back iPad data recovery is not only easy to use but allows users to recover up to 22 different types of files quickly and effectively. It is the first choice for almost all kinds of data retrieval for all iOS devices running all iOS versions including the latest iOS 12/11.4/11.3. You can also restore one of the iTune/iCloud backups to get your videos back. But be warned that this method often means that your existing data will be permanently replaced by the data in the backup, which could lead to data loss. If you still want to restore the videos from a previous backup, here's how to do it. To restore via iTunes, Connect the iPad to your PC and then launch iTunes. Click on the iPad and then click "Restore Backup..." to get them back. To restore via iCloud, you first of all need to erase all the contents and settings on your iPad. Go to Settings> Reset > Erase All Contents and Settings. 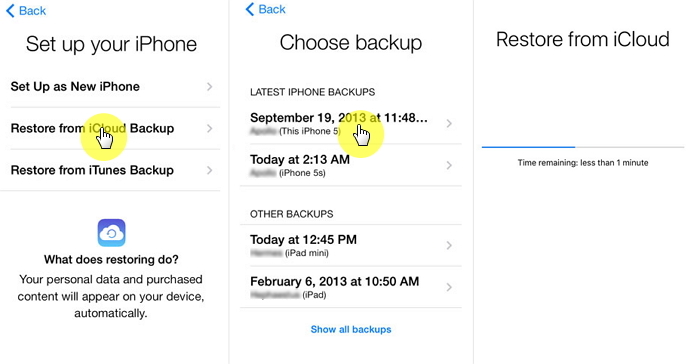 Then follow the prompts to set up your device and choose "Restore from iCloud Backup." Select the relevant backup and keep your device connected to a Wi-Fi network until the process is complete. 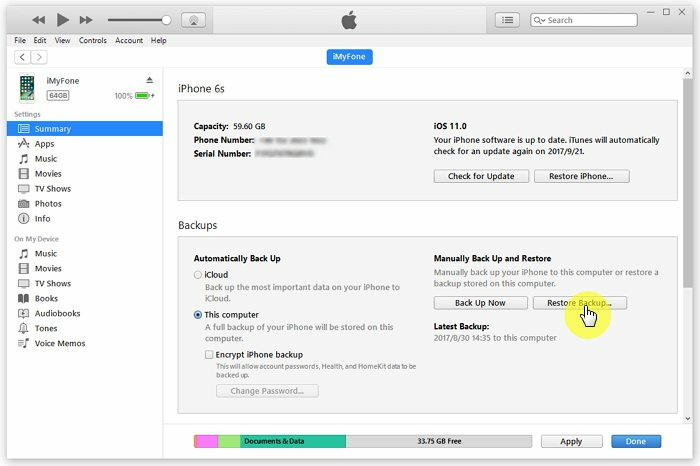 Your device will be completely replaced and all data added after your last backup can not be recovered and will be overwritten, so choose your backup file carefully. Open safari on your computer or iPad. You should access the official website of iCloud. Use your Apple ID to sign in. Once you are in the main window you can select the video icon to check if there are any lost videos available on iCloud. You can just download the videos that you are looking for to your computer. If you want retrieve deleted videos on iPad that you have purchased from the iTunes store, it will be much easier since iTunes has the information on all the videos that you have purchased and downloaded from the iTunes store. 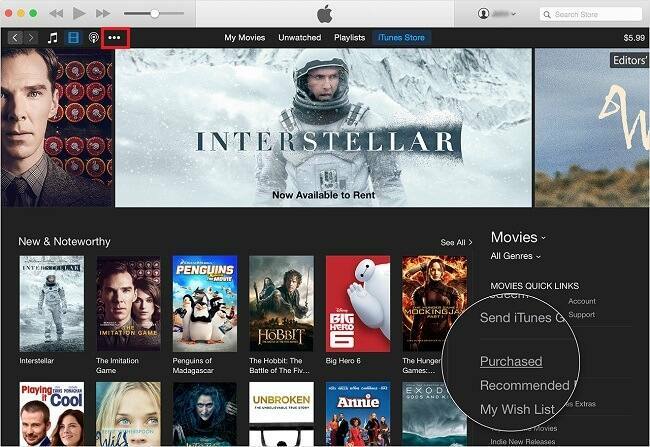 Here's how to retrieve videos from iTunes Store. Step 1: Open iTunes store app on your iPad. Choose "Purchased" option to open the list of movies, music and TV shows which you bought from iTunes Store and select movies. Step 2: Tap on "Not on This iPad" option and select the movies that you have previously deleted on your iPad. Step 3: Tap the cloud icon to begin re-download the deleted videos. can it retrieve my videos deleted three months ago?